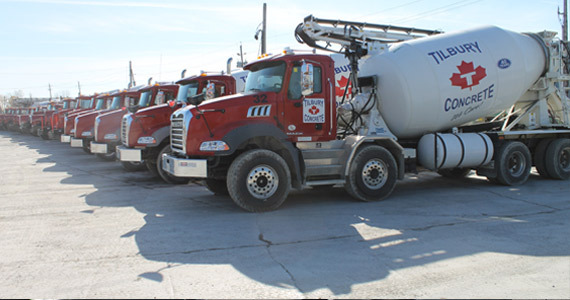 A total of 25 Tilbury Concrete ready-mix trucks on hand to deliver across Windsor-Essex County. It’s only fitting that the largest concrete producer in our region operates the biggest fleet. Our 25 Tilbury Concrete ready-mix concrete trucks – including a heavy-duty stone slinger and a half-dozen trucks with conveyor belts – utilize the Road King Global Positioning System, the ready-mix concrete industry’s leading information-relay and dispatch system. If you’re a client, this means you can rest assured that our fleet is coordinated, optimized, and ready to get to work. We can even easily provide you with real-time status updates regarding matters like truck location and loading and unloading processes.